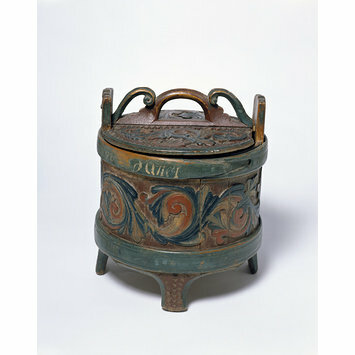 This small container was used for butter, porridge or other foods in Norway in the 19th century. It is constructed like a barrel with vertical sections, or staves, held by horizontal bands. Dried rushes were packed into the joints to prevent leaks. The tub was originally painted with an inscription, now much worn, and the date 1830. In 1891 the Museum was given the opportunity to choose items from a large collection of Norwegian painted and carved wooden objects which belonged to Mr Herbert Ingleby. He had apparently formed his collection during his travels in Norway. The curator, A.B. Skinner, chose a selection including jugs, bowls, cups, mangling boards and boxes which he recommended as useful for the study of different forms of carving and of painted designs. As well as displays in South Kensington, the Museum circulated collections of similar objects around regional museums and art colleges. 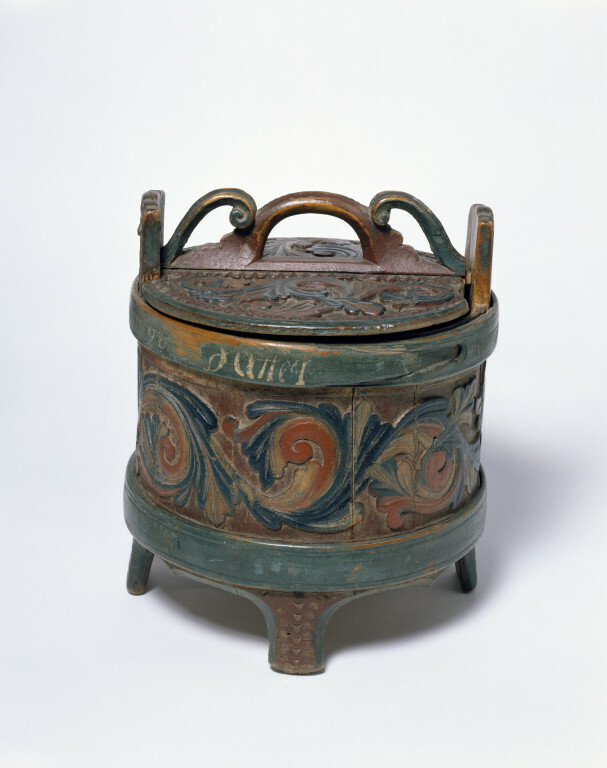 Porridge or butter tub, carved and painted wood. Curling acanthus ornamentation. The paint on this tub was added later in the 19th century. Densely curling acanthus was a chief element in the baroque style from about 1650. It did not reach Norway until about 1700, and became part of folk art, in which it continues until this day. The paint on this tub was added later in the 19th century.